Who Is Haji Bashaar Noorzai And Why Should We Care? Then they arrested him for drug trafficking. Noorzai has been cooperating with counterterrorism officers in Afghanistan, leading them to large caches of dangerous weapons, including Stinger missiles. Two contractors employed by the United States government promised him safe passage to the United States to be debriefed, and told him he would not be arrested and could return home at his leisure. They brought him here and introduced him to federal agents, who proceeded to welcome him and put him up in a fancy New York hotel for ten days. A shadowy figure with ties to the Taliban, Noorzai is heavily involved in international heroin trafficking, according to a federal indictment that is pending against him in New York. But he is a tribal rogue whom U.S. terrorism fighters have relied on, while looking away from his darker side as a dope dealer. For years, the relationship was mutually beneficial—Noorzai helped U.S. authorities uncover huge numbers of terrorist weapons, including Stinger missiles, and in return he got to ply his drug trade with impunity. The clashing impulses of America’s war on terror and the war on drugs were brought home by the arrest of a man who was a U.S. ally in one war and an adversary in the other, Bill Powell writes in Time. Like the Afghan government, drug traffickers are exerting influence over farmers through carrot and stick programs, and the drug traffickers appear to be better funded. Many farmers receive payments in advance for the coming poppy crop, a fact that, in practice, obligates them to grow poppy even if it is against the law. And with police corruption so rampant in drug-growing areas, farmers often find that police are the people encouraging – or forcing – them to grow poppies. “The counternarcotics law is out of date,” says a UN official. “If you are arrested in Helmand, you have to be tried in Helmand, and there is no guarantee of a fair trial. There are no secure prisons to detain people. Haji Bashar Noorzai is one of the leaders who surrendered along with Taliban vehicles and around 1200 weapons of all types in return for assurances of amnesty. Noorzai recently hosted a lunch for Governor Sherzai and a senior US military official at Maywand, 40 kilometres west of Kandahar city. Bashar, one of the biggest opium tycoons of Afghanistan, was one of two tribal leaders of Kandahar who were to be handed over control of the province by Mullah Omar before his departure. Americans are said to have rewarded Bashar in cash for changing sides and expect him to help in the hunt for Osama, Mullah Omar and other Taliban leaders. KANDAHAR, Afghanistan (Reuters) – Afghanistan’s interim government has adopted a live and let live policy towards old Taliban foes, the movement’s warlord allies and drug barons who bankrolled the hardliners’ six-year rule, a senior official said on Tuesday. “If these people hand over their weapons, agree to cooperate, and to live quietly, then we will tolerate them,” said the official, who asked not to be named. One has been the contentious issue of Haji Bashar, widely regarded as immensely wealthy, an alleged opium smuggler on a vast scale and a financial supporter of Taliban rule with his own private army. The officials say he has since handed over thousands of arms, and has pledged to give up opium production and trafficking, and to live quietly in Maiwand district northwest of Kandahar. It was rumoured in Kandahar that Haji Bashar was sitting on a huge opium stockpile — the raw material for heroin. Haji Bashar had also helped recover 10 U.S.-made Stinger shoulder-fired anti-aircraft missiles and handed them over to U.S. officials in 1991. This too had to be taken into account. The missiles had been distributed to anti-Soviet guerrillas in the 1980s and there has been concern in Washington that they might find their way to guerrillas elsewhere. “He’s a very prominent member of the Noorzai tribe, one of the biggest Pashtun tribes in the country. We don’t want to start a long and destructive feud with the Noorzais,” the official said. Tribe, clan and family were all issues that required delicate handling. “Haji Bashar has been interrogated by the Americans and we have questioned him,” the first official said. “We’re happy, the Americans are happy. Everbody’s happy,” he said. Today, Noorzai, 43, sits in a small cell in the high-security section of Manhattan’s Metropolitan Correctional Center, awaiting a trial that may still be months away. But whatever his fate, the Case of the Cooperative Kingpin raises larger questions about America’s needs, goals and instincts in fighting its two shadow wars: the war on terrorism and the war on drugs. US has a history of ‘double crossing’ it allies. CIA has expounded on Britain’s MI5 policy during WWII that was initially used for counter-espionage against NAZI agents. From WWII through Korea and VietNam and now the Middle East Wars, the US has employed the ‘Double Cross’ strategy in the form of ‘disinformation’ and deception. US plays opponents as suckers with promises and attractive deals to enlist their help. Double Cross is not a Foreign Policy. “You can try to kill us, but we will still grow poppy,” one farmer told CNN. Bashir Noorzai is one of the brothers heading the largest tribe in Afganistan. One of his other brothers may be a CIA stooge..
Bashir Noorzai was tricked into coming to the United States, he was told he would receive an award from then president Bush. He was wined and dined at an expensive hotel for two weeks and then at the direction of the head of the DEA, handcuffs were snapped on him. When the Judge started asking too many questions the feds changed their prosecutors 3 times, each time switching to a younger and less saavy prosecutor who would not have to lie to evade the judicial questioning in chambers. When Noorzai was arrested he was placed in a cell without windows so he could not face East to pray towards Mecca. This is now the BIG WIN for the head of US DEA…and may have been the factor (the timing was the same) that creating the “Surge” against allied troops by infuriating the largest clan in Afganistan. All by violation of Foreign Corrupt Practices Act. A NY Post article 10 months ago or so was written by a guy who was under indictment by the Feds for something else. So he may have slanted his article as directed. The real criminals govern us. Who has the authority on this Earth to make one of G-d’s creations illegal? Noorzai attorney suggested that Noorzai prosecutor Boyd Johnson was somehow complicit in Rosetta’s misdeeds. The government, fearing the worst, took Johnson off the case and added him to the witness list. But since the case isn’t going anywhere, Johnson was bored and asked for something to do. US Attorney Mike Garcia had a brilliant idea. He’s gone and made Johnson the lead prosecutor on the Elliott Spitzer prostitution ring story. Given Johnson’s penchant for shady dealings, he should feel right at home on this one. We all just hope he kept clean on this one! Working with the enemy. Wait… Who’s the enemy? I put that in quotes because that’s probably the only way most media will describe Haji Bashir Noorzai, part of whose story appears in today’s New York Times, written by James Risen. Risen is one of the Times’ best reporters. He’s written some great stuff on Guantanamo . Most notably he and colleague Eric Lichtblau broke the story on domestic surveillance last year that enraged the White House. It’s a little hard to tell whether today’s piece on Noorzai is will lead to other related reporting on how the US government and the Bush administration have used people and thrown them away, but I wouldn’t be surprised. 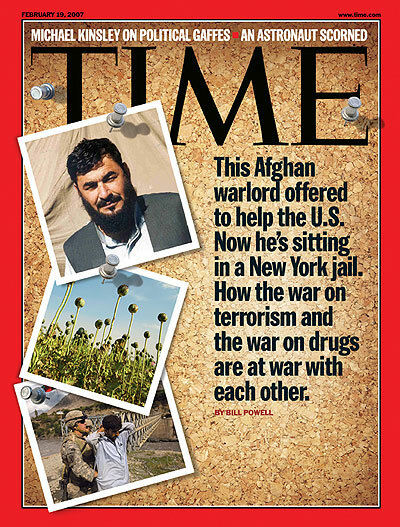 In April 2005, federal law enforcement officials summoned reporters to a Manhattan news conference to announce the capture of an Afghan drug lord and Taliban ally. While boasting that he was a big catch — the Asian counterpart of the Colombian cocaine legend Pablo Escobar — the officials left out some puzzling details, including why the Afghan, Haji Bashir Noorzai, had risked arrest by coming to New York. Now, with Mr. Noorzai’s case likely to come to trial this year, a fuller story about the American government’s dealings with him is emerging. Who is this guy? Where did he come from? Mr. Noorzai, a wealthy tribal leader in his mid-40s who lived with three wives and 13 children in Quetta, Pakistan, and also owns homes in Afghanistan and the United Arab Emirates, is from the same region that helped produce the Taliban. A native of Kandahar Province, he was a mujahedeen commander fighting the Soviet occupation of Afghanistan in the 1980s. In 1990, according to his lawyer, he agreed to help track down Stinger missiles provided to the Afghan resistance by the C.I.A. ; agency officials were worried about their possible use by terrorists. So early on he had done some work for the CIA. The DEA also knew him. D.E.A. officials say that at the same time, Mr. Noorzai was a major figure in the Afghan drug trade, controlling poppy fields that supplied a significant share of the world’s heroin. He was also an early financial backer of the Taliban. Agency officials say he provided demolition materials, weapons and manpower in exchange for protection for his opium crops, heroin labs, smuggling routes and followers. That brings us up to 9/11. Noorzai was still living in Pakistan at that time but later that year he met with US officials in Afghanistan. There they did a kind of bait-and-switch deal with him before employing him, or so it would seem from what his American lawyer, Ivan Fisher, has been telling the New York Times. In November 2001, he met with men he described as American military officials at Spinboldak, near the Afghan-Pakistani border, Mr. Fisher said. Small teams of United States Special Forces and intelligence officers were in Afghanistan at the time, seeking the support of tribal leaders. Mr. Noorzai was taken to Kandahar, where he was detained and questioned for six days by the Americans about Taliban officials and operations, his lawyer said. He agreed to work with them and was freed, and in late January 2002 he handed over 15 truckloads of weapons, including about 400 antiaircraft missiles, that had been hidden by the Taliban in his tribe’s territory, Mr. Fisher said. Mr. Noorzai also offered to act as an intermediary between Taliban leaders and the Americans, his lawyer said. Mr. Noorzai said he helped persuade the Taliban’s former foreign minister, Wakil Ahmad Mutawakil — the son of the mullah in Mr. Noorzai’s hometown — to meet with the Americans. In February 2002, the Taliban official surrendered after what press accounts described as extensive negotiations and was sent to the prison at Guantánamo Bay, Cuba. He was freed in 2005. Mr. Noorzai also persuaded a local tribal figure, Haji Birqet, to return to Afghanistan from Pakistan, the lawyer said. But he said the Americans, falsely warned that Mr. Birqet and Mr. Noorzai were plotting to attack United States forces, killed Mr. Birqet and wounded several family members in a raid on his compound. Saying that his credibility had been hurt by the imprisonment of Mr. Mutawakil and that he was angered by the attack on Mr. Birqet, Mr. Noorzai broke off contact with the Americans and fled to his home in Pakistan, according to Mr. Fisher. So Noorzai at this point could be forgiven for being a little bit leary of US officialdom. Here was a guy, not at all uncommon in Pakistan and Afghanistan, who was a thriving drug dealer (considered by many to be a legitimate business) who has a relationship with a government that condones the drug business when they have other uses for him, but could crack down hard on him at any time, once he’s no longer useful to them. In May 2002, one of his tribal commanders was killed in an American raid along a drug-smuggling route that the Americans suspected was used to help the Taliban, and Mr. Noorzai may have feared for his own safety. Into the picture comes one Bobby Charles, “former top counternarcotics official at the State Department” who admits that “finding terrorists has always trumped chasing drug traffickers.” Until, of course, chasing a drug trafficker gets you a kiss from the White House, or so it appears. One of the many anomalies of the Bush administration’s action in Afghanistan and the Middle East has been Bush’s promise to end-Afghanistan-drug-production-as-we-know-it. An arch conspiracy theorist said, back in 2001, that we should treat that promise very skeptically. The drug trade, he said (and many other non-conspiracists have agreed) has been very, very valuable over the years to assorted government agencies and indeed attempts have been made over the years to tie the Bush family to drug profiteering through banks and other institutions. I tend to be a believer. In any event, the conspiracy theorist turned out to be right: Afghanistan’s drug production has gotten very healthy indeed. “Going after drug lords,” however, remains politically very valuable. Jailing and trying someone like Haji Bashir Noorzai can have its bennies for hard-pressed politicians or appointees working in relevant government agencies. In any event, all that help in negotiating with the Taliban given by Noorzai to the DEA and CIA in Afghanistan isn’t helping him much now. The agencies have officially forgotten him. And so betrayed him. The government officials could not confirm whether Mr. Noorzai had in fact played a role in those negotiations… Nearly two years later, in January 2004, Mr. Charles, the State Department official, proposed placing him on President Bush’s list of foreign narcotics kingpins, for the most wanted drug lords around the world. At that time, Mr. Charles recalled in an interview, no Afghan heroin traffickers were on the list, which he thought was a glaring omission. He suggested three names, including Mr. Noorzai’s, but said his recommendation was met with an awkward silence during an interagency meeting. He said there was resistance to placing Afghans on the list because countering the drug trade there was not an administration priority. Mr. Charles persisted, and in June 2004, Mr. Noorzai became the first Afghan on the list. Two months later, a team of American contractors working for the Federal Bureau of Investigation contacted Mr. Noorzai and arranged a series of meetings with him in Pakistan and Dubai, according to several government officials and Mr. Noorzai’s lawyer. They wanted to win his cooperation and learn about Al Qaeda’s financial network and perhaps the whereabouts of the former Taliban leader Mullah Muhammad Omar. The Americans met with Mr. Noorzai, but the talks fizzled because F.B.I. agents who were supposed to join them were unable to do so, one official said. In 2005, the contractors, by then working for the D.E.A., reconnected with Mr. Noorzai and once again met with him in Dubai. This time, however, the objective had changed. Mr. Noorzai had secretly been indicted by a federal grand jury in New York on drug smuggling charges in January 2005. Now the contractors needed to persuade Mr. Noorzai to come to the United States. And so they duped him, scooped him up when he came to New York, and stuck him in Guantanamo. Mr. Fisher said the Americans were particularly interested in gaining Mr. Noorzai’s help in tracking the flow of money to the Taliban and Al Qaeda. They were seeking information about Mullah Omar and other Taliban figures. The Americans asked Mr. Noorzai to come to the United States to meet with their superiors, he added. Mr. Noorzai’s lawyer said his client agreed to make the trip only after receiving assurances that he would not be arrested. Mr. Fisher also says that he has obtained transcripts from tape recordings made by the government at the sessions. Mr. Noorzai flew to New York in April 2005 and was taken to an Embassy Suites hotel, where he was questioned for 13 days before being arrested, his lawyer said.Mr. Noorzai has been charged with conspiring to import more than $50 million worth of heroin from Afghanistan and Pakistan into the United States and other countries. The Justice Department is probing the relationship between the Federal Bureau of Investigation and a small investigative firm that helped American officials make a headline-grabbing arrest of an Afghan warlord. Under scrutiny are several payments that the firm, Rosetta Research and Consulting LLC, may have made to foreign government officials, including an Afghan diplomat in London, court documents suggest. Little is publicly known about the now-defunct Rosetta, which was founded in 2003 by a former Treasury Department researcher, Michael Patrick Jost. The firm’s goal was to “develop highly sensitive information regarding the funding of terrorist activities worldwide and to make commercial use of this information,” according to a description of the firm offered in court papers. “Rosetta sought and obtained millions of dollars of investments,” according to the court filing “and developed relationships with high levels of officials in the FBI” and Department of Defense. The firm played a central role in helping law enforcement officials develop contact with an Afghan warlord, Bashir Noorzai, whom the government is now prosecuting in New York for heroin distribution, Mr. Noorzai’s lawyer claims in court documents filed yesterday. Details about Rosetta are emerging in Mr. Noorzai’s case because his attorney, Ivan Fisher, is alleging that Rosetta violated the law in its pursuit of Mr. Noorzai on behalf of the government. In a twist to the case, Mr. Jost yesterday filed a sworn affidavit on behalf of Mr. Noorzai describing an investigation into Rosetta that was conducted by the Justice Department’s internal watchdog, the Office of the Inspector General. The investigation centers on the FBI’s relationship to Rosetta. Despite a sale’s pitch by Rosetta delivered to senior FBI officials, the FBI never signed a contract for the firm’s services, according to Mr. Jost’s account, which was confirmed by a former federal official. “They came to the FBI proposing to rent us their extensive database about people in the Middle East,” the former official said. Mr. Jost’s account raises questions about whether individual FBI employees improperly shared information with Rosetta and whether Rosetta bribed foreign officials with the knowledge of some FBI employees. In 2006, Mr. Jost told the Justice Department investigators that an FBI employee “had been looking up information in FBI databases and forwarding it to Rosetta,” according to his testimony. The FBI employee, who is not identified in Mr. Jost’s account, was considering taking a job with Rosetta, according to Mr. Jost. The investigators reviewed Rosetta’s financial records, Mr. Jost said, adding that he identified some payments as going to “an Afghan diplomat serving in London.” Other money, potentially millions of dollars, Mr. Jost said, “went to government officials in Afghanistan and Pakistan.” A spokeswoman for the inspector general, Cynthia Schnedar, declined to comment. During its short existence, Rosetta’s main enterprise was to develop a relationship with Mr. Noorzai, the Afghan’s lawyer, Ivan Fisher, claims in court papers he filed yesterday. Rosetta had obtained from a source in the Office of the Secretary of Defense a list of individuals whom “our government believed could provide strategic assistance in interfering with” terrorism, Mr. Fisher claims in court papers. Mr. Noorzai, who was the head of a million-man-strong tribe in Southern Afghanistan was on that list, Mr. Fisher’s letter to the court claims. Mr. Noorzai may have been an attractive figure to American foreign policy officials because of his extensive track record with the Central Intelligence Agency over the years. He had helped recover unused Stinger missiles dating back to the war with the Soviet Army in Afghanistan and returned them to American officials, according to news accounts. Rosetta employees offered to deliver Mr. Noorzai to the FBI. Rosetta, according to Mr. Fisher, did get access to Mr. Noorzai, by bribing foreign officials from Afghanistan, Pakistan, and the United Arab Emirates. One recipient of the payment, an Afghani diplomat stationed in London, put Rosetta in touch with a former Pakistani intelligence official, who also received payment from Rosetta, to arrange for an introduction with Mr. Noorzai, according to Mr. Fisher’s court filing. Mr. Fisher’s account does not provide exact figures for the alleged payments. Nor does the account make clear exactly on the behalf of which government agency, if any, Rosetta was pursuing Mr. Noorzai. Mr. Noorzai made several trips to Dubai to meet with Rosetta employees he believed were representatives of the American government, according to transcripts of those conversations that have been reviewed by The New York Sun. Mr. Noorzai knew these two contacts as “Mike” and “Brian.” Mr. Noorzai has said he had only seen Osama bin Laden once in passing. Mr. Noorzai was under the impression that American officials would help install him in the new Afghanistan government, according to his court filings. In April of 2005, under the pretense of working out such a deal, Mr. Noorzai flew to New York and spent two weeks in a hotel at the Embassy Suites in Lower Manhattan talking with agents from the Drug Enforcement Administration. He was arrested and spent the last three years awaiting trial on drug charges. Before Mr. Noorzai arrived, there was at least one meeting in Washington with DEA agents, a federal prosecutor, and Mr. Jost, according to Mr. Fisher. According to Mr. Fisher, a disagreement ensued over whether to arrest Mr. Noorzai when he arrived or not. Rosetta’s position was to provide safe passage to Mr. Noorzai, Mr. Fisher said. Only then did the law enforcement officials inform Mr. Jost that Mr. Noorzai had already been indicted on the heroin charges, according to Mr. Fisher’s account. In court papers, Mr. Fisher argues that the safe passage Rosetta employees promised to Mr. Noorzai is binding on the federal government, and he urged a federal judge to release Mr. Noorzai.